Okay you guys know that I posted the other day about the Diva Va Voom from PCCrafter and said to watch for more cards with this cute cute set, well I got another one done tonight! I really like this one because my friend LGuild is into wine and I immediately thought of her, but let me make it clear Linda does not look like the lady riding the wine bottle *okie thinks Linda would probably think about riding a wine bottle though if they were made that big*. I was able to show Linda the Diva Va Voom set today when she came by and she loved it! I found the sentiment on the internet and thought it was a great for turning this image into a birthday card. I used Microsoft Word using the Printing on Shape cardstock method to do the sentiment on the yellow mat. The inside was done just the regular way, but I do make a table so I can get the sizing right. The grapes are are from MSWord clipart. You can click on the picture and make the image bigger if you can't read it. 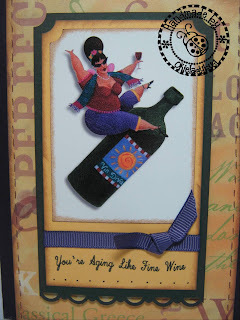 I have had the wine themed patterned paper for awhile now and kept wondering what I could use it for and when I sat down to make the card I knew I could use it! This image is better than than the lady in the shoe since I did some playing around with it and made it smaller and printed on a glossy paper. At least now I will know how I need to print the others when I get ready to use them. 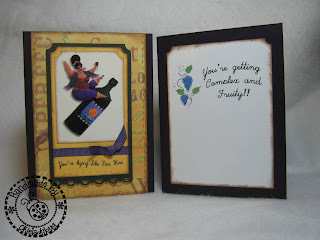 I used the Stampin Up Ticket Punch on the corners at the top and a Stampin Up border punch at the bottom of the green mat. The ribbon is also Stampin Up. I still have a few more of these adorable fat ladies to use so keep watching for the others in the set!! Cute images...your friend will love it. What is that font? I like the hand-written look of it! And I like your watermark stamp with the lady bug... is that new? Hestia the font is called "script". I can't remember if it is one I downloaded or if it came with MSword. The watermark is my stamp that I put on the back of the cards I make. I took it into my photo program and made the background transparent so I could use it for my photos. I have had the stamp now for well over a year. OMG this is just too flippin funny!!! LOVE everything about it!! ROFL! Love it!!! I've got some old PC Crafter images that I haven't used for at least 2 years. Forgot all about them till I saw your cards. I love how you used them! Heading over there to get me some of these divine divas! This is so cute! Does she print in color or did you color her? She is wonderful. The images do come in color so no need for me to spend time doing it! LOL I did add the drop shadow to the image in my photo program. I love these girls! They really make a cute card. OMG! As a wine lover, I love her. Thanks! You're right, I don't look like her. My hair is shorter! LOL! But the "build" is pretty accurate and I do prefer red wine! 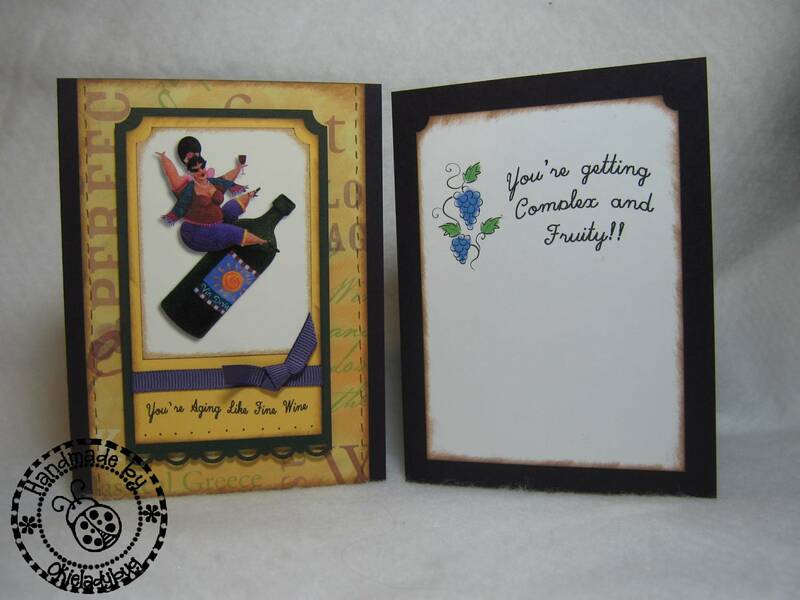 I don't know which card I like the best--because you know I'm a shoe collector as well as a wine lover!